A series of mods that will increase game performance. Your results may vary, greatly. Includes modified Bethesda texture map for use with Skyrim. I guess if you want to use these files in your mod, I would be surprised, but if you get the idea from me, just credit me so I can feel good for contributing -- mostly just for the idea, as this was an extremely easy task. 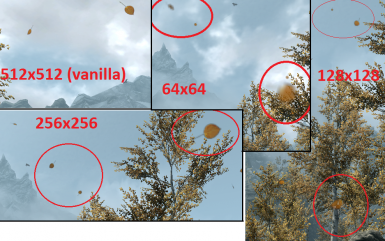 Something that I realized the first time I played Skyrim -- the particles are asking too much, even for upper mainstream game computers. Got some performance problems? Give these series of mods a try. They certainly can't hurt. Some users are reporting performance problems with certain effects like snow and rainfall. I had big problems with the falling aspen leaves in The Rift area of the game. 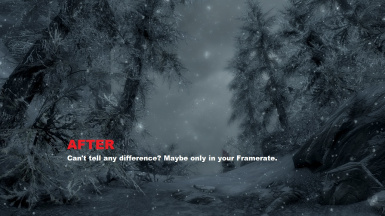 Skyrim was designed for consoles, which have good CPUs, but weak GPUs. It's generally the opposite for PC gamers, which have extremely powerful GPUs. It's important to mention, the console versions run at only ~30 FPS, at lower resolutions, and indeed have framerate problems at times. However, PC gamers play at higher resolutions, and use effects like Amibient Occlusion, Anistropic Filtering, Anti-Aliasing, and Post Processing Effect Filters. This really puts a burden on the PC. Especially because this game is already very demanding of a CPU. Even the real-time shadows are CPU intensive. The special effects in this game, like snow and rainfall, are called particles, and are rendered by the already overtaxed CPU. Therefore, by reducing the textures in these particle effects, we can expect a variable degree of graphic performance improvement, depending on your system and graphic setup. Thanks to Arsenalrobert for the video! The Rift, or Autumn area of Skyrim, is the most graphically demanding part of the world, on my computer. I figured I could greatly increase performance in The Rift by degrading the quality of the complex falling leaves FX. The vanilla leaves are 512x512px, fast moving, animated objects, with 64 frames of animation, and upwards of 20 can fall at any time. The leaves require more animation as they are asymmetrical and are spinning and twirling. Even in the best of situations, this contributed to a significantly lower minimum framerate in this area, compared to other parts of Skyrim. The falling pine needles, for comparison, are only 128x128 with just 4 frames of animation. Nice as they look, I think most of us here would rather play the game than look at a slideshow of a forest. There are several versions of this mod of varying performance. The leaves move quickly. The drop in quality isn't as obvious as it is when looking at a screenshot. However, take a look to compare the graphic degradation you might notice. I use the 128x128 version, which is a very significant reduction while still looking... relatively the same. Many users like the 'Extreme Performance' edition. Depending on your computer and settings, your results will vary. For me it feels like a 5-20 FPS improvement, with an i5-750 CPU. Someone else has similar results, using a FPS meter. Check the comments for more info. The improvement will be most noticeable if your framerate is low. This is especially the case when turning and sprinting through the Rift, with several NPCs around, and shadows enabled. These mods do not increase your framerate, they only help keep your framerate from dropping as significantly when the effects are underway. Your computer should be able to keep up without problem when you are just standing there. As such, it is more difficult to quantify; hard to prove. When my computer is under the most strain it began struggling to keep up when the leaves fell. I would have significant losses of frames -- maybe 20 frames lost at a time -- before using this mod, now I only see a very slight ~5 FPS drop when the leaves begin to fall, with the 128px version. All CPUs have different have strengths and weakness. You can go to any benchmarking site and you can see wild differences from rendering performance to encoding. So let us know if it helps for you or not. Also, it would be nice to find out what CPU and GPU you use, and what version of the leaves you tried. There are many other factors that determine performance, of course. I use the highest textures available for Skyrim, and play at 1920x1080 resolution. Of course things like that will make a big difference in one way or another. Another thing that may have been misunderstood, is that the leaves are 512x512p, however this is the texture size for all 64 leaf animation frames, in total. Each frame of animation is NOT 512px. If that was the case, the leaves alone would eat up all the memory. 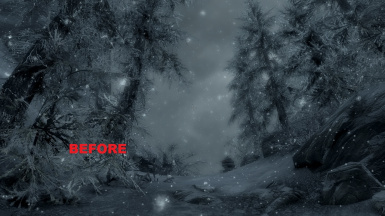 * SNOW: Travel to Winterhold and you can usually find a blizzard.